eBay hosts an annual Skunkworks competition, where employees are given a few weeks to create new feature prototypes and demo them at a company-wide expo. In 2011 I joined a team with two talented developers and we hacked an Xbox Kinect to prototype a virtual fitting room called Fashion Kinect. 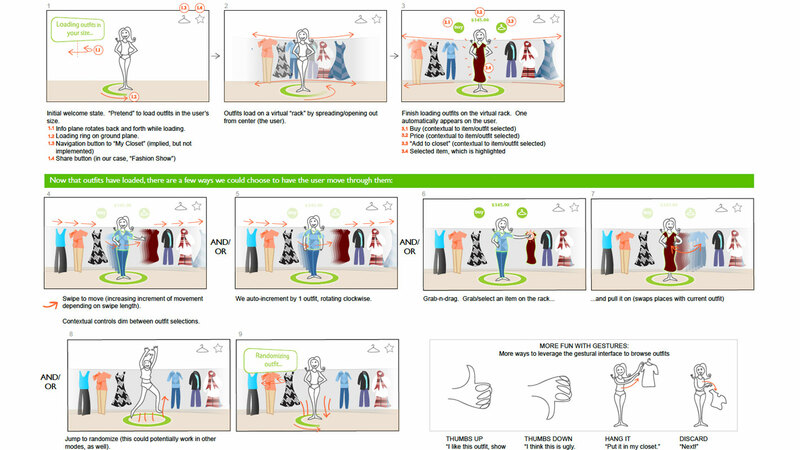 Fashion Kinect allowed people to shop for clothing on eBay, try pieces on via texture mapping, and even share with friends using “fashion show” mode. We started the project during a 24-hour hackathon. I storyboarded our primary flows and designed key parts of the interface while the developers got the Kinect working. This was particularly challenging because it was created before Microsoft released an official Kinect SDK. I produced a pitch video (complete with animation and voice narration) which secured us as finalists for the expo. The video was a hit and shown to the Board of Directors, and the final prototype, which allowed people to try on a variety of clothing pieces including a gorilla suit, won People’s Choice. Although the prototype was definitely a rough proof-of-concept, the idea and presentation was strong enough to make an impact. To find out about some best practices in Kinect design that I learned from this project, read my post “Designing Kinect-Based Experiences”. © eBay Inc. Patent pending.